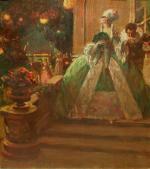 Nice scene from masquerade was created by Czech painter and graphic artist Alois Wierer, born 1878. 1902-1904 he studied at the Prague Academy under Fr.Thieleho, later in Munich. The artist lived and Worked in America and was adored for his genre scenes and views of Old Prague. 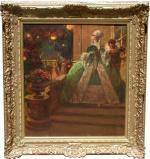 His paintings are on permanent exhibit in the Modern Gallery of Prague. Literature: "General Artist´s Lexicon " by Thieme/Becker, Leipzig, 1999; Dr. P.Toman "Czech Artist lexicon", Praque,1960. Technique: oil on canvas, original frame.